Museums in Haiti have generally been overlooked by scholars and members of the public due to a wide range of misconceptions regarding the country’s precarious condition during certain periods of its history. At times, these notions have led to inaccurate assertions that ‘Haiti has no museums’ as well as comparisons between its museums and the museums of other nations in a manner that negatively portrays the former. In reality, however, the resilience and perseverance of the Haitian people has allowed for the continuous conservation of their tangible and intangible heritage despite times of social, political, economic, environmental difficulty. As this thesis will demonstrate through field work as well as a contextualized review of the literature and elements of Haitian history, Haitian museums are vibrant,socially important spaces where identity construction, heritage interpretation,public education, and the preservation and dissemination of cultural traditions are able to take place. Thesis (M.A.) --University of Florida, 2012.
by Natália Marques da Silva. 4 ACKNOWLEDGMENTS F irst and foremost I would like to thank my thesis chair, Dr. Ben jamin Hebblethwai te, and the members of my committee, Dr. Glenn Willumson and Dr. Mark Thurner for their continuous feedback and support throughout this process. I extend my gratitude to Dr. David Geggus and Dr. Robin Poynor, whose seminars also informed my research In a ddition I thank Erin Zavitz Tess K ulstad and Heather Barrett for helping me prepare for fieldwork; a nd those who he lped me during it : Nina Hein and Edrice Fleurimond K enrick D emesvar ; the m anbo at Nan Souvenans Jean Baptiste Jean Luis, Kjersti G ausvik Tate W atkins and Nathan C anney In addition I thank the many other museum professionals and museum supporters without whom an accurate portrayal of Haitian museums would have been impossible to achieve: Mireille F ombrun, Olsen Jean Julien, Dr. Rachelle Charlier Doucet Dr. Rodrigue Thomas, Georges Nader Jr., Erol Josu, Michelet Divers, Enoch Trouillot Luckner Candio, Gerald Alexis Claudine Corbanese, a n d Charite Joseph. Lastly I would like to thank my colleagues in the University of Florida Museology Program ; Patrick Grigsby and Laura Robertson for their administrative support ; my friends and family members for their kind ness and patience ; and my wonderful and irreplaceable parents, Lucia Helena and Jos Carlos da Silva, for letting their dau ghter venture out in the streets of Ayiti ak zanmi m Msi anpil anpil! 9 Abstract o f Thesis Prese nted to t he Gra duate School of The University o f Florida in Partial Fulfillment of the Requirements for t he Degree of Master of Arts MUSEUMS IN HAITI: CURRENT ASSESSMENTS AND INTERPR ETATIONS By Natlia Marques da Silva December 2012 Chair: Ben jamin Hebblethwaite Major: Museology Museums in Haiti have generally been overlooked by scholars and members of the public ious condition during certain periods of its history. At times, these notions have led to museums and the museums of other nations in a manner that negatively portrays the former. In reality, however, the resilience and perseverance of the Haitian people has allowed for the continuous conservation of their tangible and intangible heritage despite times of social, political, economic, environmental difficulty. As this thesis will demonstrate through field work as well as a contextualized review of the literature and elements of Haitian history Haitian museums are vibrant, socially important spaces where identity construction, heritage interpretation, public education, and th e preservation and dissemination of cultural traditions are able to take place. 18 1995 and with the help of its B electronic security system, international grants for conservation, climate control improvements, and building modifications; and a sustainable working budget composed of gift shop sales, donations, and reven ue from fundraising auctions (Boulos, 1995). In the late 1970s and early 1980 s the administration of the dictator Jean Claude Duvalier of cultural institutions perhaps as a political move to exhibit autonom y and control in a fledging state In 1979, a presidential degree led to the creation of the Institute for the Conservation of National Heritage (ISPAN), as a function of the Ministry of Culture and Communications (Elie, involved the restoration of the Citadelle Laferrire fortress and the Sans Souci Palace, which were added to the UNESCO World Heritage SCO, 2012). The old national museum was reestablished in 1982 as the Muse du Panthon National Hatien (MUPANAH). It was housed in a structure originally intended as the mausoleum of Franois Duvalier, Jean which was later reserved by the Museum of the Fathers of the Nation, and finally set aside for the National Museum due to its prominent spot near the National Palace (Paret, 2010). The new setting was paired with five permanent exhibition spaces to interp ret Haitian history from the pre Columbian era to modern times, as well as a large space for traveling exhibitions (Paret, 2010). The reevaluate its educational and research mission, it did not receive the same facelift as the national museum (Doucet, 2001). 22 part of their inherited land could be used for the formation of a public interpretive site and museum (Boyer, 2012). It consist s of some colonial structures as well as 18 th century buildings and equipment from the period when sugar production resumed, and the museum contains pre Columbian ethnographic artifacts. have been established to date, was the Muse Georges Liautaud in Noailles, Croix de Bouquets. It was established in 2008 by the Bouquets (ADAAC), with financial support from UNE SC O among other sources. It was nam e d after a famous artist from the area, Georges Liautaud, and intended as a space where artists could get together to view and display contemporary works of art (Przeau, 2009). The museum was built as a covered open air pavilion and open grounds with an adjacent art library and computer room. The trajectory of Haitian museums dramatically changed course in Janua ry 12 of 2010, when a 7.0 magnitude earthquake killed hundreds of thousands of people and left just as many inju Logne caused widespread destruction to the capital and neighboring towns. In the moments after the major shock of the earthquake was felt, Elisabeth Prval, the former First Lad y of Haiti desc huge cloud of dust rising from the city below carrying desperate cries of sorrow and calls for help; crowds of wounded children and cited in Kurin, 2011 p. 17). Images shown in the media and the accounts of other survivors illustrate a time of confusion, pain, and sorrow. 23 Hospitals, churches, schools, police stations, and even the most basic of infrastructure were in shambles. The National Palace and th e National Airport were virtually unusable, as were many roads and systems of communication. The rubble also and the murals of the Episcopal Church Varying degrees of damage also affected artifacts at the Parc Historique de la Canne Sucre and MUPANAH (Kurin, 2011). Just as medics, police officers, firefighters, and aid providers step ped in to help people du ring troubling times, however, so too did museum professionals and Kurin, 2011, p. 24). The effort to save the cultural artifacts damaged by the earthquake was not small in scale. It was titled the Haiti Cultural Recovery Project and involved the combined efforts of the Government of Haiti, the Government of the United States, t he Smithsonian Institution, the U.S. and Haiti Committee of the Blue Shield, the International Centre for the Study of the Preservation and Restoration of Cultural Property (ICCROM), La Fondation Connaissance et Libert (FOKAL), ISPAN, UNESCO, and several other partners, associations, and individual volunteers (Bertrand, 2010; Haiti Cu ltural Recovery Project. 2012). 32 materials can be used, sites cleared for farmland, metal objects melted for money, and on a larger scale, she describes the use of a helicopter during the theft of a bronze cannon in St. Louis du Sud (p. 121 122). in the construction of national identity as the two sites that do receive a great amount of gover nment attention: the Sans Souci Palace and the Citadelle Laferrire The ruins of Henri Christophe regal residence and the fortress that never sought. Over the year s, they have been featured prominently in tourism campaigns as well as in house examples of grandeur. Their present political importance was demonstrated earlier in 2012 when President Michel Martelly visited the Ci tad elle to view the progress of its resto ration. The meeting led to an unexpected angry outburst by the president, whose enragement over what he perceived to have been inadequate thousands of Haitians (Le No uvelliste, 2012). The shouts of the president discredited the individuals who work for the restoration of the Citadelle while portraying him as an advocate i n the eyes of the public Since then, r estructuring has taken place through the creation of a single governmental unit that now specifically oversee s the Citadelle, Sans Souci, and the buildings at Ramiers (Caribbean Journal, 2012). The choice in monuments is not necessar ily due to a disregard for other historical sites, but rather an allocation of dwindling resources. According to Helaine Silvermann (2006), many countries in Latin America (and the Caribbean) struggle with balancing the glory of the past with the current e conomic limitations creat ing To Haiti, MUPANAH, the Citadelle, and the Sans Souci are the equivalents of that glory. 39 historically unfounded as there are plenty of examples of positive influence, historical connectedness, and the blurred lines between what is Western and what is not. Of the stat e, it can be said that museums play a pivotal role in the Haitian government that has enabled their continuation despite situations that would otherwise appear to inhibit them. Figure 3 1 View from the MUPANAH rooftop in May of 2012. Figure 3 2 View from the MUPANAH rooftop in October of 2012. 59 on among family members, visitors from other pla ces can easily learn more by paying one of the many independent guides. Although guides o ften have a more physical role in other waterfalls that cannot be easily reached without guidance, primar y purpose is in the oral explanation of th with the spirits. Figure 4 1 : Earthquake damage of the Muse d'Art Hatien. 60 Figure 4 2 : Pieces from the Muse d'A r t Nader permanent collection. 62 Figure 4 4 : The Muse Ogier Fombrun. 63 Figure 4 5 : Fauna display at the Muse du Peuple de Fermathe. 64 Figure 4 6 : Display at the Muse de Guahaba. 66 Figure 4 8 : Entrance of Saut d'Eau. 68 different parts of the world and are seeking to share ideas and resources and disproving ideas that Western models are setting them back. As this thesis demonstrated, Haitian museums are comparable to museums in other regions as centers of the protection and dissemination of heritage, and even offer models that other regions would benefit from exploring such as the open format of the y not only fitting Haitian museums within the l iterature but through field work that demonstrates erature that define s museums through broad terms that do not exclude non universal museums. In closing, this understudied element of Haitian culture should be further explored as many other questions remain. From archival research to surveying the role of museums in the classroom, the field is open to new possibilities and interpretations, yet characterized by a lack of scholarship. Until then, however, Haitian museums will continue regardless, even if those who are not fortunate enough to visit them believ e they do not exist. 70 APPENDIX B PRICES FUNDING AND STAFF SIZE Table B 1 : List of entrance fees, funding, and staff size. Museum Entrance Fees Funding Staff MUPANAH C: .50 S: $1.25 A: $3 F: $3 P, G, A L Haiten Closed P, Gr/Fd L Closed C losed n/a Muse de Guahaba Donations P, A S Free G L Muse Peuple de Fermathe Donations P, A S Muse Georges Liautaud Free Gr/Fd S Muse Ogier Fombrun C: $2, SL $2, A: $5 P, Gr/Fd, A S Legend: Entrance Fees: C: Children, S: Student, A: Adult, F: Foreigner (Converted to US dollars) Funding : P: Private, G: Government, Gr/Fd: Grants/Foundation, A: Admission/Donation Staff Size: Small (s) : 1 4, Medium (m) : 5 9, Large (l) : 10+ Contain a different price for school groups. 71 APPEN DIX C GENERAL CONDITION RE PORT Table C 1 : Condition of buildings and (exhibited) collections. Name Collection Building Muse The collection is currently being stored in large freight containers outside of the museum. L eaking roof; broken windows; damaged storage area. The collection is being housed at the Galerie Nader. Many of the damaged pieces were restored after the earthquake. Collapsed during the earthquake. MUPANAH Some paper artifacts are i n deteriorating condition due to being in constant display; the remainder of the exhibited collection appeared to be in good condition. Pristine condition. Muse du Bureau Artifacts need to be reorganized matched with proper identification. Roof needs to be fixed, new storage area needed. Muse Ogier Fombrun Some paintings contain water damage; some artifacts have been painted green; the aqueduct was mortified and needs to be restored. Roof needs to be fixed. Muse du Peuple de Fermathe M any objects are on degraded condition due to constant exposure. No known problems. Muse de Guahaba Many objects are on degraded condition due to constant exposure. No known problems. Muse Georges Liautaud Collection items may appear worn out but are intended for outdoors. No known problems. Parc Historique de la Canne Sucre Pristine condition and post earthquake restoration. Pristine condition. 72 LIST OF REFERENCES Alexis, G. (1995). [Catalog i ntroduction]. In Le M (3 4) Port au Prince: Alexis, G. (20 10). Contemporary Haitian art: Private collections Public p roperty. Museum International 62 (4), 55 64. American Alliance o f Museums (AAM). (2012). About m useums. Retrieved on November 26, 2012 from: http://www.aam us.org/about museums Andermann, J. ( 2007). The optics of the state: Visuality and power in Argentina and Brazil Pittsburg: University of Pittsburg Press. Appadurai A. and C. A. Breckenridge (1 992). Museums are good to think: Heritage on view in India. In I. Karp, C. M. Kreamer, and S. D. Lavine (Eds. 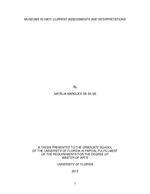 ), Museums and communities: the politics of public culture (34 55). Washington, D.C.: Smithsonian University Press. Arjona, M., Brinkley, F. K., C amargo Moro, F., Ebanks, R. C., Espinoza, M., Lacouture, policy: aims, prospects and challenges. Museum: Museums, heritage and cultural policies in Latin America and the Caribbean, 3 4 (2), 72 82. Le Nouvelliste Baptiste Haiti Mission (2012). History Retrieved on November 26, 2012 from http://www.bhm.org/abou t us/history/ Baptiste Haiti Mission (2012). Wallace and Eleanor Turnbull Retrieved on November 26, 2012 from http://www.bhm.org/wallace and eleanor turnbull/ Bertrand, W. (2010). Haiti: Threatened cultural heritage and new opportunities. Museum International 62 (4), 34 38. Boulos, R. H. [Letter to museum s upporters]. In (1 2) Port au Boyer, M. (2012, May). Parc H istorique de la Canne Sucre: Cultural pillar with a proud past Magic Hati 40 42. Camargo Moro, F. (1982). New directions in museum organization. Museum: Museums, heritage and cultural policies in Latin America and the Caribbean, 34 (2), 86 89. 75 International Council of Museums (ICOM). (2007). Museum d efinition. Retrieved from: http://icom.museum/the vision/museum de finition/ James, C. R. L. (1938). The Black Jacobins: Toussaint L 'Ouverture and the San Domingo r evolution New York: Vintage Books. Joachim D. (2012, July 19). Martelly en colre contre le dlabrement de la Citadelle Henri Le Nouvellist. Retrieved on October 17 from http://www.lenouvelliste.com/article4.php?newsid=107319 Kurin, R. (2011). Washington, D.C.: Smithsonian Institution. Marchal, J. (1998). For an island museology in the Caribbean. Museum International 199 (3), 44 50. Massoni, P. (1955). Hati: Reine des Antilles Paris: Nouvelles Editions Latines. des Philadelphes (1784 1793). Annales historiques de la Rvolution franaise 320 2 10. McLeod, M. (2004). Museums without collections: museum philosophy in West Africa In B. M. Carbonell (Ed. ), Museum studies: An an thology of c ontexts (455 460). Malden, M.A. : Blackwell Publishing. Michel, C. (1996). Of worlds seen and unseen : The educational character of Haitian v odou. Comparative Education Review 40 (3), 280 294. Michel, C. (2006). Vodou in Haiti: Way of life and mode of survival In P. Bellegarde Smith and C. Michel (Eds), Vodou in Haitian life and culture: Invisible p owers (27 37). New York, NY: Macmillan. Munjeri, D. (2004). Tangible and Intangible Heritage: from difference to convergence. Museum International, 56 (1 2), 12 20. Ndoro, W. and G. Pwiti. (2005). Heritage management in southern Africa: Local, national and international discourse. In G. Corsane (Ed. ), Heritage, museums and galleries (141 153). New York, NY: Routledge Nora, P. (1989). Between Memory and History: Les Lieux de Memoire. Representations, 26 7 24. Paret, R. (2010). MUPANAH and the promotion of historical and cultural values Museum International 62 (4), 39 45. 76 Pierre, K (2011). The National Cathedral: Trying to help save what was left. In R. Kurin (Ed. ), ( 35, 206 ). Washington, D.C.: Smithsonian Institution. Preziosi, D. (2003). Brain of the earth's body: art, museums, and the phantasms of modernity. Minneapolis: U niversity of Minnesota Press. Przeau, B. (2009). L'inauguration du Muse Georges Liautaud Retrieved on November 27, 2012 from: http://www.croixdesbouquets.n et/L inauguration du Musee Georges Liautaud_a21.html Rivire, G. H. (1985). The e comuseum An evolutive definition Museum, 37 (4), pp. 182 183. Saint Lot, M. A. (2003). Vodou, a sacred theatre : The African h eritage in Haiti Pompano Beach, FL: Educa V ision Inc. Segal, R. (1996). A Haitian Space. In The black d iaspora: Five centuries of the black experience outside Africa (326 336). New York, NY: Macmillan. Silverman, H. (2006). Introduction. In Archeological site museums in Latin America (3 17). Gain esville, Fl: Univesity Press of Florida. Taylor, K. (2010, May 11). Rescuing Art From the Rubble of the Quake. The New York Times pp. C1. Toussaint Louverture Cultural Foundation (TLCF). (2012). Hector Hyppolite Catalog Retrieved on October 1, 2012 fro m: http://toussaintlouverturefoundation or.doodlekit.com/home/hector_hyppolite_catalog Toussaint Louverture Cultural Foundation (TLCF). (2012). Homepage R etrieved on October 1, 2012 from: http://toussaintlouverturefoundation or.doodlekit.com/home Toussaint Louverture Cultural Foundation (TLCF). (2012). The Foundation Retrieved on O ctober 1, 2012 from: http://toussaintlouverturefoundation or.doodlekit.com/home/the_foundation Turgeon, L., & Divers, M. (2010). Intangible Cultural Heritage in the Rebuilding of Jacmel and Haiti Jakml kenbe la, se fs peyi a! Museum International 62 (4), 106 115. Olmos, M. F. and L. Paravisini Gebert (2011). Creole Religions of the Caribbean New York, NY: New York University Press. 77 Organization for Economic Co o peration and Development (OECD). (2012). International migration database : Haiti Data retrieved September 2, 2012 from http://stats.oecd.org/Index.aspx?DatasetCode=MIG Haiti United Nation s Educational, Scientific, and Cultural Organization (UNESCO). (2012). National History Park Citadel, Sans Souci, Ramiers. Retrieved from: http://whc.unesco.org/en/list/180/ ). (2009). Port au Universe in Universe (2010). Vodou. Art and c ult from Haiti Retrieved on October 16, 2012 from: http://universes in universe.org/eng/specials/2010/vodou Vendryes, M. L. (2003). Des fragments et des traces. 888 18 23. Vilaire P (2011). Protecting surviving murals. In R. Kurin (Ed. ), heritage: Cultural recovery after the earthquake ( 26 ). Washington, D.C.: Smithsonian Institution. Wilen tz, A. (1987). Voodoo in Haiti t oday. Grant Street 6 (2), 105 123.